If you have ever read, watched, or listened to any tips on greening your life, one of the first recommendations given is to turn the lights off when you leave a room and, if you want to go the extra mile, change your light bulbs to energy efficient bulbs. Thus it is no surprise that all the light fixtures and features in the Wister Center maximize energy efficiency as we strive to achieve silver LEED certification. In my attempts to quantify our total electrical savings with light fixtures and light controls, Brad Randall, an engineer on the Wister Center, informed me that the final number will be determined based on actual occupant usage. In other words, we won’t know our true savings until we begin to use the building. In the meantime, Brad estimated we will save a minimum of 10% on electrical energy as compared to the typical new building. He is expecting the actual savings to be much higher if the lights are used less often or remain off when daylight is sufficient. The Wister Center maximizes the use of daylight to light the building in two ways. 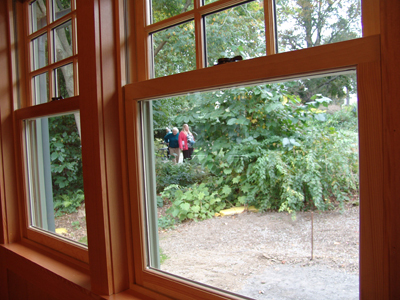 The building was designed with numerous large windows, allowing for ample daylight to enter the building and provide great views into the gardens. We have also installed four light tubes. 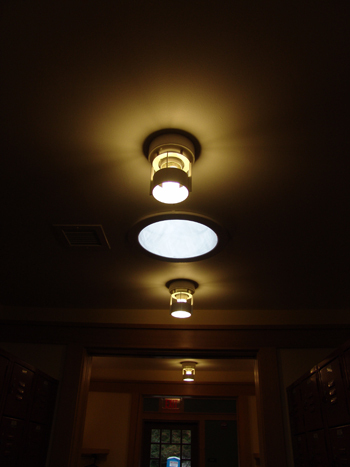 Light tubes capture light through a dome on the roof, then funnel this light through a reflective-lined tube, where it is finally projected through a transparent ceiling lens. What makes these tubes so effective at gathering daylight and projecting it into the building is the tubes are lined with a reflective surface to bounce the light along the tube. These tubes line the enclosed hallways of the volunteer corridor in the Wister Center. I have been in the Wister Center on the numerous cloudy days we have been experiencing of late and didn’t even notice that only the light tubes were lighting this enclosed space. I would have thought the fluorescent lights were on. 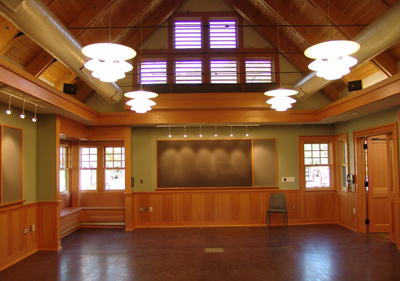 In addition to harnessing daylight to illuminate the Wister Center, we have chosen energy efficient lighting fixtures. The majority of the lights in the center are T8 fluorescent or compact fluorescent (CLF) lamps. These are the types of energy efficient light bulbs found in grocery and drug stores that you can purchase to replace light bulbs in your home. CLF bulbs use 75 percent less energy and last about 10 times longer than traditional incandescent bulbs. The 8 chandeliers throughout the building use ceramic metal halide lamps. Like other gas-discharge lamps such as the mercury-vapor lamps, they produce light by passing an electric arc through a mixture of gases. Ceramic metal halide lamps were chosen because they are more efficient than halogen lamps, have better color quality, better lumen maintenance, and better color consistency. The biggest drawback is it requires a restrike time. In other words, if you accidentally turn these lights off you must wait until the bulbs cool to turn them on again. These lights are typically used on athletic fields, in high-end professional lighting fixtures, and by reef aquarists. In addition to installing energy efficient light fixtures, we have installed mechanisms to minimize the amount of time these lights are on. 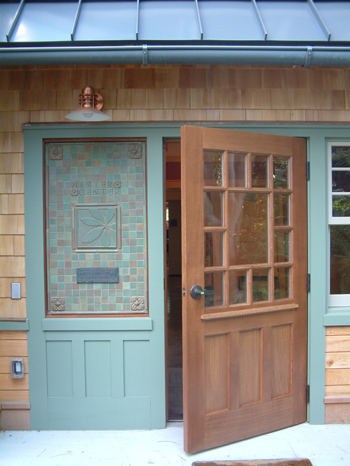 The building operates on a relay based microprocessor low voltage control system. This system turns the lights off and on at pre-programmed times of the day. Thus we are not using various light fixtures when people are not occupying the building. All of these fixtures are controlled by a touch panel which allows occupants to override any pre-programmed settings if need be. There are also numerous occupancy sensors throughout the building in spaces like the kitchen, restrooms, storage rooms, office, and janitor’s closet. 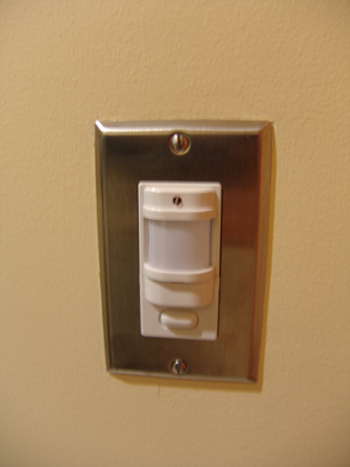 Occupancy sensors turn the light on when the sensor senses movement within the space. If it does not sense movement after seven minutes (the timer is adjustable.) the light will turn off. These sensors eliminate the worry of forgetting to turn the light off. All the light switches have an override if the sensor does not recognize your movement within the space. We are excited to see our true energy savings once we begin use of this building. Join us for our first public event in the Wister Center, titled “The Story of Wister Center” on Thursday, November 12 at 5pm. Architect Dan Russoniello will discuss all the LEED certification efforts for the Wister Center. These tubes line the enclosed hallways of the volunteer corridor in the Wister Center. Very informative post you made some good points. I especially found it useful where you stated ‘what we can do at home to save electricity, which light fixtures are efficient’. Most major lighting manufacturers make energy-efficient fixtures for every room in your home and in every decorative style. Here I Modern Lighting is an excellent place to keep track of the latest developments in LED fixtures and Contemporary Lighting. –Thanks for this. Keep up Sharing…. Very interesting article. Great blog. Thanks for tips. I love this infor about lights…Perfect… just what I was looking for!